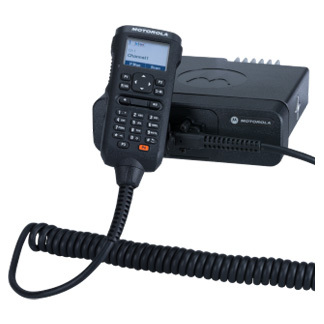 This handheld control head for the XPR 5000 Series radios allows for total installation flexibility, in-vehicle mobility, and total control of your mobile radio. The radio unit can be installed wherever it is most convenient: behind the seat, under the dash, or in the trunk. The control head can then be mounted close to the user on a standard hang-up clip HLN9073 . The standard coiled cord is 1.8m (5.9 ft) long, and will stretch to 3m (9.8 ft). An optional extension cable adds 5m (16.4 ft). The control head allows users to move around within the vehicle and still stay connected. Ambulance attendants, bus drivers and delivery drivers can take the control head into the rear of the vehicle rather than being limited to the driver’s seat. With a full keypad, color screen, and channel and volume controls, the control head offers the full feature-set of a portable radio. Contacts lists, text messages, radio settings, work order tickets and notifications are all accessible from wherever you are in the vehicle.